What dou you think about Probiotec Limited ? Thanks! I’m not familiar with Probiotec Limited though… what is it that you think makes it interesting? Had a very similar write-up in the works but you beat me to it! Great write-up though, I will likely just link to yours on my blog. I am long shares as well and see the business model flexibility as the key misunderstanding. It would be like if a mine operator could flip a switch and suddenly start producing a different commodity. Emeco can go where busines is healthy (Canada and Chile at the moment) and offset volatile markets at least to some extent. There will probably be some tax loss selling for the rest of the year on this one but if conditions stabilize and they can get debt under control next year, I think the upside could be considerable. Would be nice to see another write-up: I’m sure your perspective isn’t totally identical, but I obviously like a link to my blog as well :P. Love your blog by the way! Great point – fresh perspective is always welcomed in investing. Between you and red., the opportunity has been covered nicely but I’ll go ahead and post my view on it. Glad you have enjoyed the blog! Big fan of yours as well (read it start to finish!). Looks like some insider just sold 2/3rd of his shares, or did i misunderstand? What do you think this implies? In the filing, I read the following: “The performance shares issued under the terms of the Emeco Holdings Limited Long Term Incentive Plan and Rules lapsed”. So I take this to mean that he hasn’t sold any shares, but instead that they were part of an incentive plan and his rights under that plan expired… What do you think? Cool, thanks. Isn’t your interest expense assumption a bit high? There’s been a huge boom in mining over the past decade. You can clearly see it by how well Caterpillar and other equipment manufacturers are doing. I don’t understand how this company hasn’t made money. I don’t get it? How profitable the business has been in the past depends a bit on how you view it (do you want to count results from discontinued operations or goodwill impairments? ): but no matter how you view it they certainly made money (and returned a lot of that money to shareholders). What do you see as the pathway to value creation? Although the company is trading below NAV, I am not sure they will actually sell idle equipment to pay down debt? The company got into trouble this year because of low utilization – lack of rental demand. Then I am not sure who would actually want to buy their equipment. In 2013 and 2012, their disclosed sustaining capex are 71.8 and 127.1 respectively. Their PP&E-specific depreciation are 103 and 126 respectively. So while the business doesn’t need to spend crazy amount of capex each year just to keep up with the competition, sustaining capex roughly offsets depreciation, making “owner earnings” about the same as reported income. So maybe the company is not that cheap if we value it from a cash flow/earnings perspective? Selling idle equipment is the only option that the company has to manager their debt level: that is what they have committed themselves to do this year and this is what they have been doing. And just because their utilisation is low, it doesn’t mean that the market for their equipment is dead. It’s just that as a rental company a slowdown in demand will have a disproportionate effect on utilisation because of the nature of their business. About capex: seeing capex equal depreciation does indeed mean that reported earnings are also ‘owner earnings’, but it also implies that the book value of the assets is roughly equal to the economic value. The downside scenario is basically that the company needs to partly liquidate itself, so what matters is the asset value. And what remains should be valued using cash flow or earnings, but the remaining assets on a going concern basis are certainly worth more than in a liquidation scenario. They do generate solid revenue and cash flow numbers from the equipment that isn’t idle. I own the stock after reading your writeup and red’s. I might write about it soon if I have anything interesting to say. Those insider buys are encouraging to see. Pretty substantial too, almost 1 million shares in total :). Opened a position. The more I see, the more I like. Any thoughts on the catalyst for a more appropriate valuation? timing? Also, are they committed to paying dividends as they move forward / liquidate equipment? Is that likely to continue to be part of the investment thesis? I think that simply surviving the next few years and showing investors that they can pay down their debt will be a good catalyst. You don’t need to expect a dividend in the near future, they are actually prohibited from paying one, or repurchasing shares, as part of the deal to modify their debt covenants. 3) Acquired? – werent some hedge funds rebuffed by them recently? Option 2 would imply bankruptcy and a potential zero for the equity. Can’t figure out your numbers in the P&E disposals – where do ‘gain on disposals’ and ‘total disposals’ come from?? See footnote 7 in the latest annual report for the gain on disposals, and the cash flow statement for the total disposals. 1H report is out, and seems like the debt covenants may be challenging given the 2H guidance. Are they going to go back for another change to the covenants? Seems to me that they are on track to meet the covenants. 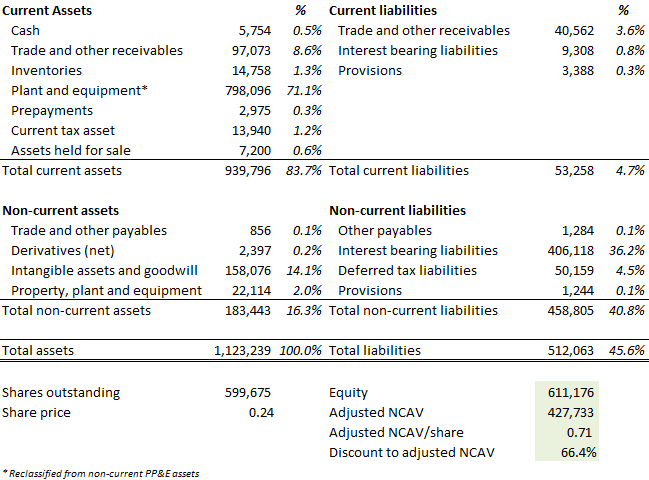 Now 320M in debt, and mid-point of EBITDA guidance is 88M. So debt would need to be reduced to 88*3.5=308M (and 287M for low-end of guidance). Should be doable, and I assume they can always speed up asset sales if required by offering a bigger discount. Looks like they are floating a new notes offering. . Assume that the gearing will be more favorable? • Fitch Ratings assigned Emeco a corporate rating of B+ with a stable outlook.